0013107: CentOS 7 with encrypted RAID 1 partitions won't boot up in degraded mode. As the summary says, the machine won't boot up if one of the disks is removed. To my understanding the system should still boot up in degraded mode, when one of the disks fails or is removed. It looks like md devices just won't start. 2. Manually create a RAID 1 partition for /boot and encrypted RAID 1 partitions for / and swap. See the details from the attached anaconda-ks.cfg. 3. Finish the installation, update all packages (yum update) and verify that the machine can be rebooted normally again. 4. Shut down the machine, remove the second hard disk, try to boot again, and notice how the boot fails. and drops to emergency shell. which kicks INACTIVE md devices to run by "mdadm -R" after timeout. But this timeout is by default set to rd.retry=180 seconds, so it is too late. 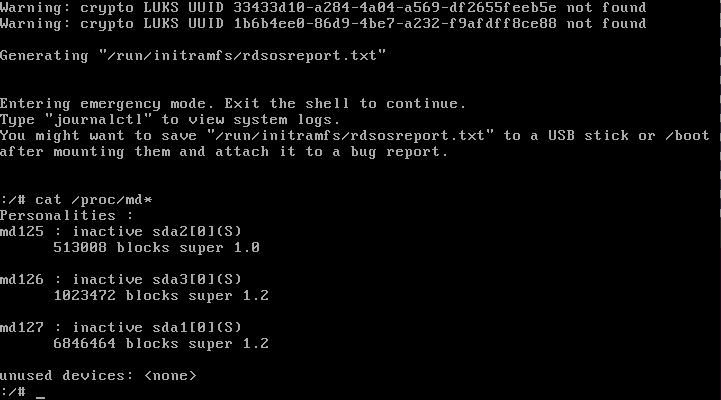 Workaround is to add "rd.retry=20" kernel option on boot. can continue boot in degraded RAID mode. Is there a reason why the default is set to 180 seconds in /usr/lib/dracut/modules.d/98systemd/dracut-initqueue.sh? 30 seconds should be the default according to the manual (man dracut.cmdline) and that's what's used in /usr/lib/dracut/modules.d/99base/init.sh. Dunno. The document is stale, so this may be reported as a bug as upstream dracut. or there was some disk subsystem which needed longer than 30 secs to come up. Do the same if systemd is not used, e.g. in kdump case. So it seems that timeout was enlengthed for non-systemd case. Still, document (dracut.cmdline.7.asc) is stale.